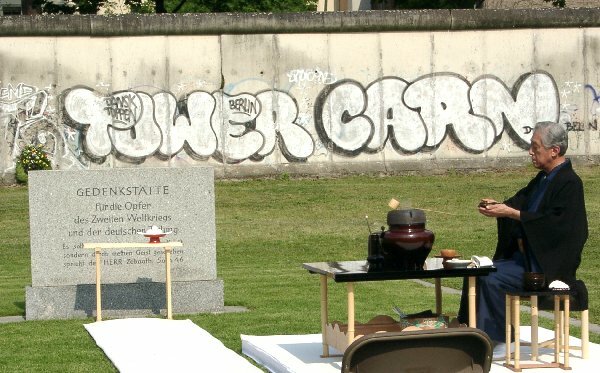 Dr. Genshitsu Sen, Former Head Tea Master of the Urasenke School of Tea in Kyoto, Japan, preparing and offering tea for World peace on May 10, 2000, at the Memorial for the victims of World War II and the Berlin Wall at the 19th century Sophien Cemetery in Berlin. Dr.Sen has spent his adult life traveling the world sharing tea with others. The Urasenke School of Tea has branches, chapters and study groups in many locations throughout the world. Dr. Sen often says "ichi wan kara peacefulness" (peacefulness through a bowl of tea). He believes that when people come together and share a bowl of tea, peace can be realized.